A few years ago, downy mildew hit our beloved impatiens plants. Industry wide, we were told to stop selling them. New Guinea impatiens weren’t affected, but many of us starting scrambling to come up with creative alternatives for our shade gardens. Being a total plant geek, I was thrilled to rise to the challenge. The first plant that I discovered works well in partial shade is a houseplant that I have liked for decades- Crossandra. The flowers are a stunning apricot/orange and the leaves are really shiny. This only grows 12-18″ tall and looks good in windowboxes and in the front of containers. Coleus was one of the very first plants I grew from cuttings, rooted in a glass of water on my windowsill, when living up at UConn. It sure has come a long way since the 70’s! 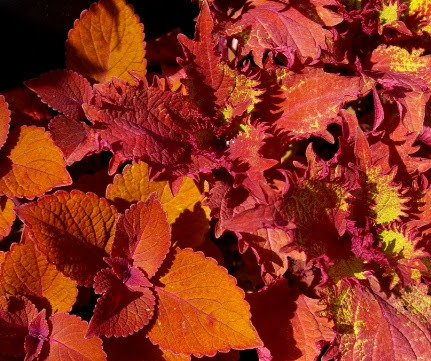 The colors and textures are so varied, there is a Coleus for every application. On the left is ‘Campfire’ and the frilly one is ‘Henna’. They do fine in shade or sun and you too can take cuttings and grow them as houseplants next winter. 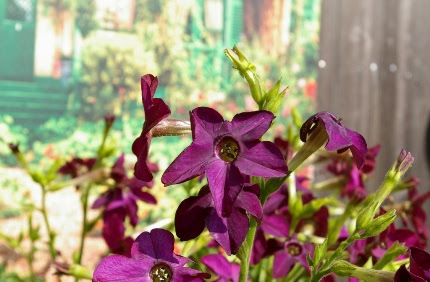 ‘Perfume Deep Purple’ is a fragrant Nicotiana that also stays open during the day. I love Nicotiana, also called flowering tobacco. I have always grown the evening scented varieties with white flowers that are closed during the day and open to emit an intoxicating perfume at night. The new hybrids stay open during the day but don’t have the nice fragrance. These are not for deep shade but they do nicely in dappled light or very early morning sun. Other shade tolerant annuals include all sorts of begonias for flowers and foliage, Caladiums, native Browallia americana, and Torenias.